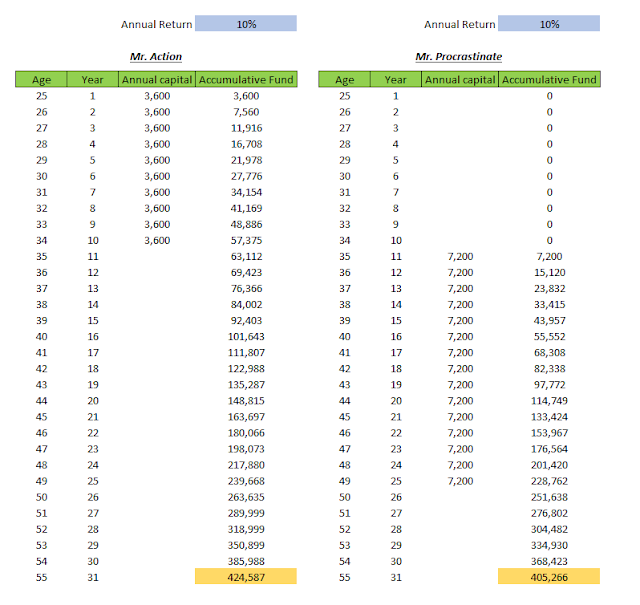 I think many of us understand the power of compounding effect. The compounding refers to generate earnings on top of previous earnings. The two paramount elements in this concept are time and annual return. Mr. Action who started to invest at the age of 25 and invest an annual amount of 3,600 for 10 years and consistently achieved a return of 10% each year. Mr. Procrastinate who only started to invest 10 years after Mr. Action started, at the age of 35 and invested a double amount of 7,200 annually for an even longer period of 15 years. He was able to achieve a return of 10% each year consistently too. At the age of 55, Mr. Action is still richer than Mr. Procrastinate even though Mr. Procrastinate invested triple amount of what Mr. Action did, but just 10 years later. Of course the annual return can play a role here. Mr. Procrastinate can easily surpass Mr. Action if he able to achieve a higher annual return. But I think it's easier to start invest early rather than to achieve high return, right? 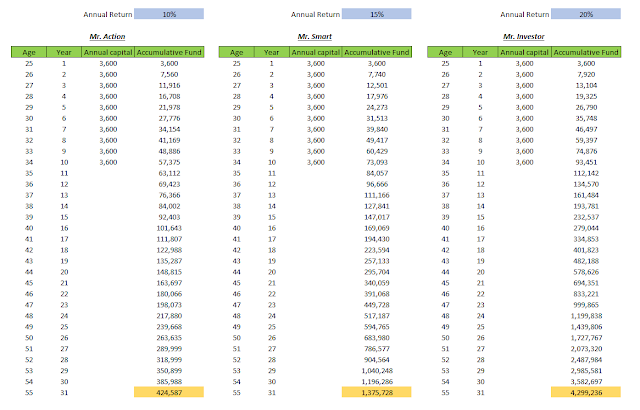 Let's compare with another two people with Mr. Action who invested the same amount and begun at the same time but with higher annual return rate than Mr. Action. 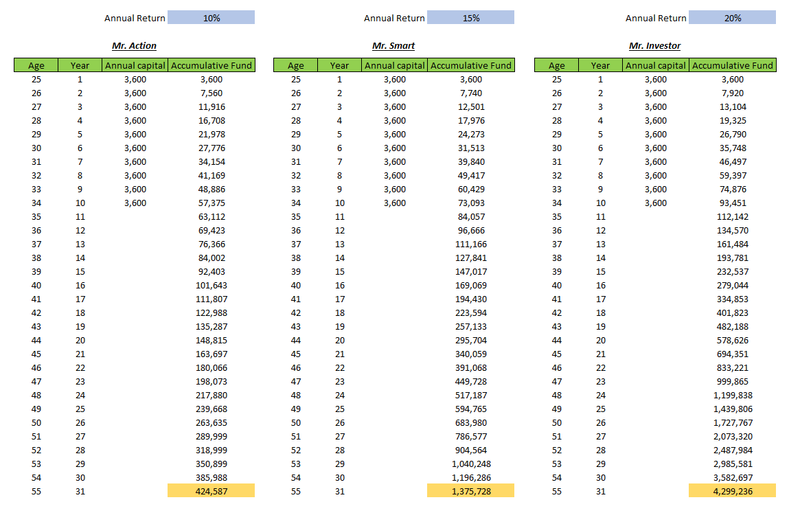 Mr. Smart who able to generate a 15% annual return has around 1.3 millions at the age of 55 while Mr. investor who able to generate a great 20% annual return has around 4.3 millions at the age of 55. See the difference between Mr. Action and Mr. Investor. A 10% difference in annual return is what it takes for Mr. Investor to have ten times more money than Mr. Action at the age of 55. Of course, it's not easy to achieve 20% return consistently for 30 years. So, the annual return does has a greater impact than time. But I think we can easily manage our time better than the annual return. 3,600 annually, 300 per month, RM10 per day. RM10 per day, a 15% annual return and you can be a millionaire in 30 years time. I think you can fork out RM10 per day, right? So, do you want to be Mr. Procrastinate or Mr. Action or Mr Smart or the great great great Mr. Investor? 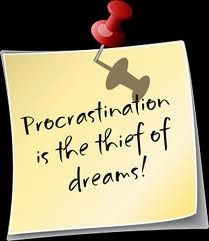 Put this at your note, Procrastination is the thief of dreams! !